Style: Choker. 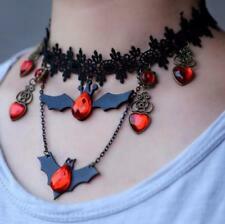 1 x Necklace. Color: Black. We strive for 5-star service by providing high-quality goods and perfect service. LOVELY NATURAL BALTIC AMBER NECKLACE MULTI- COLOR. stone:natural amber. It's said that amber is not only happiness and health stone but also a love talisman. condition:new, 100 % hand made. Style: Choker. 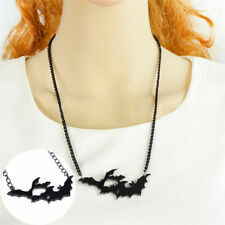 1 x Necklace. Warm regards from CreativeStudio88! Color: Black. We strive for 5-star service by providing high-quality goods and perfect service. 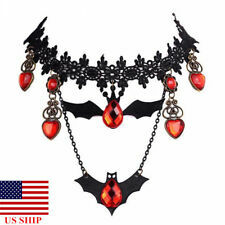 Lace Choker Necklace Bat Crystal Pendants Retro Punk Halloween Cosplay Jewelry. Brand New. 12 Strand Authentic Freshwater Pearl Necklace. 16'' with 3" adjustable strap. MSRP is $250, Selling for $80. BOTH IN EXCELLENT CONDITION! STURDY WELL MADE PIECES! 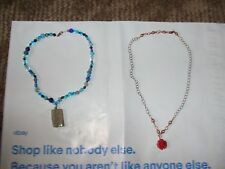 20" COPPER TONE RED ROSE PENDENT NECKLACE 10" DROP PLUS TURQUOISE BEAD WITH SANDY STONE PENDANT 16" 8" DROP. About Fashion Place. not usually that long in most cases.